The polyurethane chemistry allows it to be molded into unusual shapes and enhance industrial and consumer products by adding comfort and convenience. Polyurethanes are formed by reacting polyols with a diisocyanate or a polymeric isocyanate in the presence of suitable catalysts and additives. A variety of products are manufactured based on wide range of polyols to meet the needs of specific applications. Polyurethane products are used in wide range of consumer goods used in day-to-day life. The uses of polyurethane ranges from flexible foam in upholstered furniture, rigid foam for insulation in walls and roofs, TPU used in medical devices and footwear, to coatings, adhesives, sealants, and elastomers used on floors and automotive interiors. The base year considered for the study is 2015, and the forecast has been provided for the period between 2016 and 2021. Polyurethane is a highly versatile material and can be used in a wide variety of applications ranging from insulation in building & construction to coatings and sealants in automotive applications. MDI and TDI can be mixed with polyols in a variety of methods to form rigid, semi rigid, flexible, hard, and soft polyurethane. It is durable, lightweight, safe, affordable, and recyclable. Its ability to be molded in various forms and ease of use make it suitable for use in various industries. Its broad hardness range is its most unique characteristics, which ranges from soft materials as an eraser as well as hard materials as surf boards. It offers good abrasion resistance and toughness. Its durability and toughness is higher than most of the plastics. The abovementioned properties make it commercially viable for many industrial and commercial applications, thus driving the global polyurethane market. 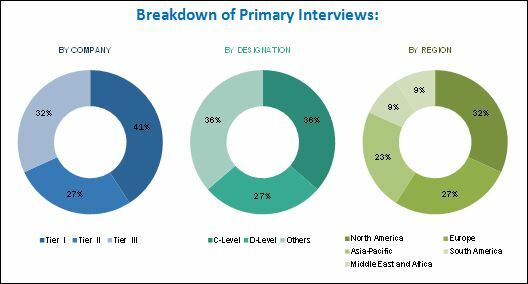 During this research study, major players operating in the polyurethane market in various regions have been identified, and their offerings, regional presence, and distribution channels have been analyzed through in-depth discussions. Top-down and bottom-up approaches have been used to determine the overall market size. Sizes of the other individual markets have been estimated using the percentage splits obtained through secondary sources such as Hoovers, Bloomberg BusinessWeek, and Factiva, along with primary respondents. The entire procedure includes the study of the annual and financial reports of the top market players and extensive interviews with industry experts such as CEOs, VPs, directors, and marketing executives for key insights (both qualitative and quantitative) pertaining to the market. The figure below shows the breakdown of the primaries on the basis of the company type, designation, and region considered during the research study. The polyurethane market comprises a network of players involved in the research and product development; raw material supply; product manufacturing; distribution and sale; and post-sales support. 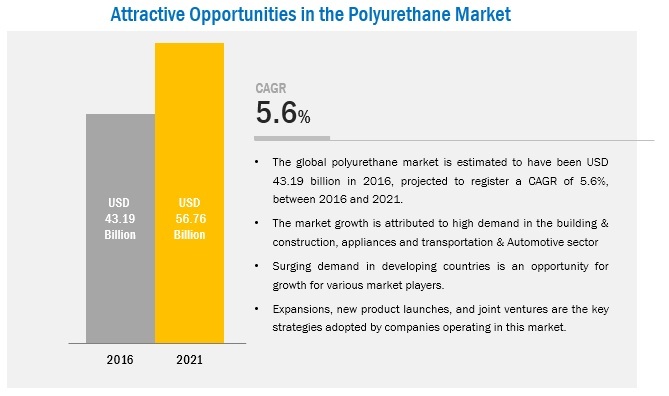 Key players considered in the analysis of the polyurethane market are Covestro AG (Germany), BASF SE (Germany), The Dow Chemical Company (U.S.), Wanhua Chemical Group Co. Ltd. (China), and Huntsman (U.S.). In October 2016, Covestro introduced a new waterborne polyurethane technology in its newly launched product INSQIN. This product enables wider application scope and reduction in manufacturing costs. In October 2016, Manali Petrochemicals acquired Notedome Limited (U.K.) for USD 18 million to tap the polyurethane market across 45 countries in the U.K.. In September 2016, BASF expanded its polyurethane system plant in Bangpoo, Thailand to convert the site into an ASEAN hub for the production of polyurethane systems. With this expansion, BASF expanded its polyurethane production capacity to meet the growing market demands in the transportation and footwear segments in ASEAN. What are new application areas which the polyurethane companies are exploring? The global polyurethane market is projected to reach USD 56.76 billion by 2021, at a CAGR of 5.6% from 2016 to 2021. The use of PU in the footwear industry in the last few years has made it a worthy replacement to materials such as, Polyvinyl Chloride (PVC) and Ethylene Vinyl Acetate (EVA) because of ease of processing and designing. Polyurethanes are synthetic resins composed of organic units connected by urethane linkage. They are mainly prepared by reacting diisocyanates, methylene diphenyl diisocyanate (MDI), and/or toluene diisocyanate (TDI) with a range of polyols (polyester and/or polyether polyols). Polyurethane products are versatile, modern, and safe. The key polyurethane products include coatings, adhesives & sealants, foams, and elastomers. These products have wide range of applications in building & construction, automotive & transportation, bedding & furniture, footwear, and appliances & white goods. They offer many solutions for energy conservation and ecodesign. The polyurethane market has been segmented, on the basis of product type, into flexible foam, rigid foam, coatings, adhesives & sealants, elastomers and others. The market for rigid foam is expected to grow at the highest CAGR between 2016 and 2021. To maintain uniform temperature and lower noise levels in residential as well as commercial properties, builders are adopting rigid polyurethane foam. These foams are effective insulation materials that can be used in roof and wall insulation, insulated windows, doors, and air barrier sealants to save energy. The polyurethane market in APAC is expected to grow at the highest CAGR during the forecast period. APAC is the fastest-growing market for polyurethane. Owing to increasing demand on the domestic front, increasing income levels, and cheaper raw materials, Asia Pacific has emerged as the leading consumer as well as producer of polyurethane materials. 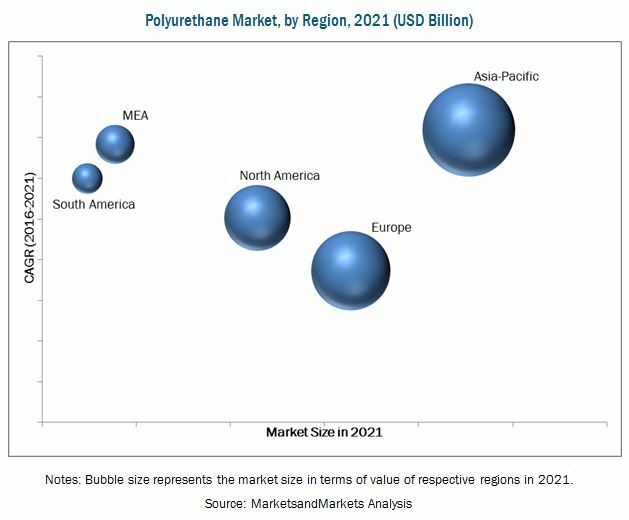 South America, especially Brazil and Argentina, have also emerged as key markets for polyurethane. Their proximity to the U.S. is expected to enable them emerge as key targets for production facilities. The growing urbanization and improvements in living standards of populations, and increase in the usage of polyurethane in the construction industry and its ability to adhere strongly, its exceptional mechanical & insulating properties, and chemical & heat resistance are driving the market for polyurethane. Bedding & furniture is the largest end user market for polyurethane. Polyurethane, in the form of flexible foam, is one of the most popular materials used in home furnishings such as furniture, bedding, and carpet underlay. As a cushioning material for upholstered furniture, flexible polyurethane foam makes furniture more durable, comfortable, and supportive. The flexible polyurethane foam is recyclable; it is recycled by various methods to remove waste stream and recover the value inherent in the material. Polyurethane plays a key role in developing sustainable buildings. Polyurethane finds high demand in building or remodeling homes, offices, and other buildings. The high demand is backed by its lightweight, ease of installation, durability, reliability, and versatile nature. Polyurethane has a wide range of applications in the automotive & transportation industry. The benefits of using polyurethane are comfort, safety, lightweight, and longevity coupled with design freedom. Polyurethane foam products aid automobile designers and manufacturers to design seating that can be easily assembled, disassembled, and recycled. They have the highest performance specifications over a wide range of firmness without added weight. The automotive industry is the largest user of RIM polyurethane parts. RIM maximizes the shock absorption of a car’s fender, bumper, and spoiler, without adding weight or bulk. The lightweight of RIM polyurethane give cars better gas mileage and provide engineers the freedom to create innovative designs. What are the upcoming industry applications for polyurethane? The current focus of bio-based polyurethane is to develop natural oil polyols (NOPs) that are produced from renewable raw materials such as soybean and castor oil, and can be used to decrease the petrochemical content of polyurethane formulations. According to estimates by the Centre for the Polyurethane Industry (CPI) within the American Chemistry Council, make use of NOPs against conventional polyols, which reduces total energy consumption by 23%. However, NOPs have low hydroxyl functionalities and relatively high equivalent weight, which restrict their use to solid urethanes and flexible foams, making them less suitable for rigid insulating foams. Key players in the market include Covestro AG (Germany), BASF SE (Germany), The Dow Chemical Company (U.S.), Wanhua Chemical Group Co. Ltd. (China), Huntsman Corporation (U.S.). These companies are adopting various organic and inorganic growth strategies, such as expansions, mergers & acquisitions, and new product launches to enhance their current market shares.